Waste systems carry water from sinks, bathrooms and applicances to the soil and vent pipes (or directly into underground drains. JDP supply Waste Systems in solvent MuPVC and ABS as well as push fit and compression systems in polypropylene. These include a range of waste traps. ABS solvent weld systems to BS EN1455-1. 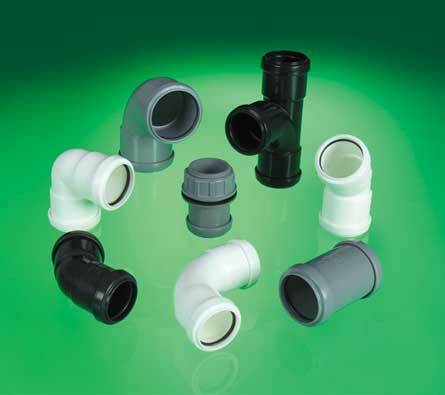 Polypropylene push fit systems to BS EN1451-1. Waste traps to BS EN274. Cut pipe cleanly at right angles to its axis using a fine tooth saw. Chamfer spigot end to ensure sealing ring is not displaced when inserted. Ensure all components are clean, dry and free of dust. Lubricate evenly round the pipe or fitting. Insert spigot allowing for an expansion gap when inserted. Read instruction on the solvent and ensure there is sufficient ventilation. Clean surfaces of spigot and socket with the degreasing cleaner. Apply one coat evenly to both surfaces using the applicator or paint brush. Each joint must be completed within 11/2 minutes. Hold for 20-30 seconds and remove any surplus solvent cement. The joint may be handled after 10 minutes and commissioned after 24 hours.